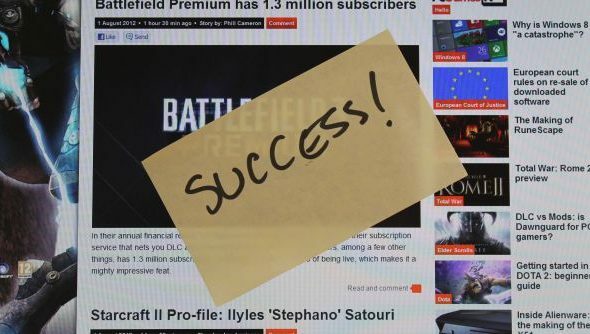 PCGamesN has just passed two first significant milestones, and it seemed like a nice time for us to talk about the plans we have for the site going forward. We’d like to try and make this an irregularly monthly thing – hopefully you’ll feel a bit closer to us and feel like you’re having more impact on the direction of the site and content. Also, it’s nice to sit down and have a bit of a chat, eh? So: first to the milestones. July is our first complete month online and we’ve reached over a quarter of a million visitors (265,839 if you want to be exact). We’ve posted somewhere in the order of 350 stories in and over a thousand users have registered for an account. Woo! There are many of you, and you are cool. In that time, we’ve had a few stability issues and the site has gone offline more than we’d have liked, which we apologise for. Our developers are working very hard behind the scenes to improve stability: hopefully, the worst of that downtime is behind us. What we want to create with PCGamesN isn’t just an editorial site – we want to create a passionate and fun community of PC gamers, and we want to reflect that community on the frontpage. The functionality we built at launch: the feeds, the ability for you to submit your own stories, and the ability to bring these stories onto our homepage is meant to do exactly that. We know from the clicks that you guys are looking at the items that our feed muncher picks up. It’s amazing how quickly the submission tool has been picked up by our small community: we’ve had over 400 links submitted in July, while our feed muncher has picked up over 1000 stories. We also know that these items are being looked at – which is incredibly gratifying. But we want to improve what they do. Have you used the feeds and submissions functionality? Have you clicked on a link or other story? Have you voted on a story to promote it to the homepage? Is there anything we can do to improve our submission or feed mechanic. We also want to prioritise the work that will make a difference to how you use the site. For instance: we were planning to add RSS feeds at a later date, after we’d included the ability to log on and comment using Facebook or your Steam ID. But, RSS feeds have been the most requested feature from you on Twitter, so we’re going to move that up to highest priority. How our voting mechanic impacts on the presentation of each story. So, what should our developers be working on? What makes the most difference to you? Outside of the development work, there’s plenty going on in editorial land. Our editorial team is now four strong including Tim Edwards, Steve Hogarty, Phill Cameron, and Jeremy Peel. We also owe a massive thanks to Joe Jamieson, Nick Wilson, Joe Robinson, Lewie Procter, Craig Pearson, Dan Griliopoulis, Kim Richardsand Henry Winchester. They are all ace. A special mention has to be made, too, to Kate Doyle, our spectacular marketing manager. Meanwhile, we’ll be launching new Ns on new games in the next few weeks. We think Planetside, Tribes: Ascend and many more games all deserve the same kind of focus we’ve lavished on our priority games. If you think we’re missing out on a particular game or series; now is the time to speak up. So that’s us. How are you?